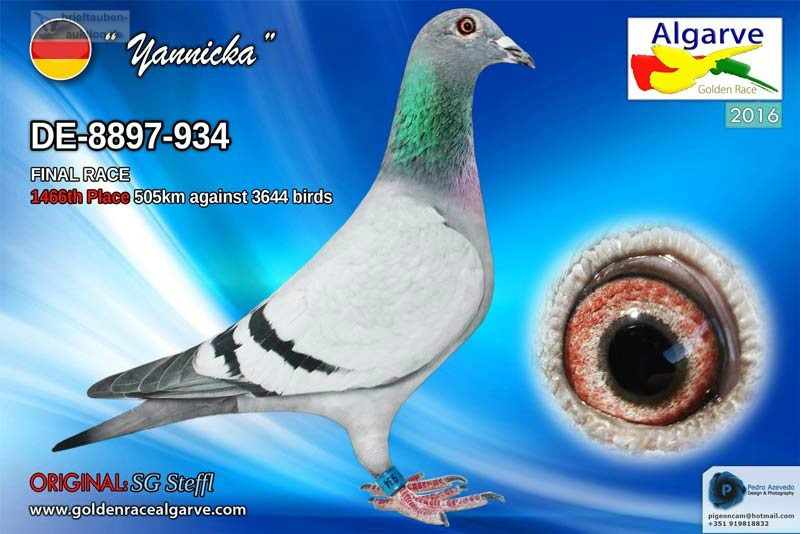 "YANICKA" our new BREEDING STAR ? A new potential breeding start is bought for our breeding loft. This time we have invested in the wonderful Algarve Golden 2016 racer "Yanicka" from the FCI 2016 winner SG Steffl. FATHER is org. Dieter Siebert and son of top sire "Pancho" (Gr.son “FIGO” from Kees Bosua) x "Panino". MOTHER is daughter to super breeder "KING ALI" (father to 12x 1 prize and gr.son “Den Dromer”). "Yanicka" is planned to be paired with the sire "Siebert" in pair 14, which can be a another exciting breeding combination at our loft.